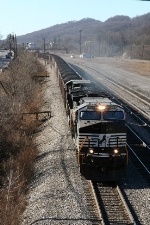 Description: Northbound is about to cross the Ohio River. Description: NS-212 clearing Mt. Airy before a day of Storms and Tornado's in Northeast Georgia. Description: 212 (on the right) passes a stopped 23M at 7:01AM. An unexpected battery change almost wrecked this photo, but I was able to get set up in time anyway. Description: 23M wastes no time as it accelerates out of Bethlehem after waiting for 212. The early morning sunlight catches both the exhaust and the rails in this photo. Description: This unit as well as 9555 came in as CHW V92 with empty grain cars. These two also stayed behind as the CHW V92 crew took another train back to Harrisonburg. 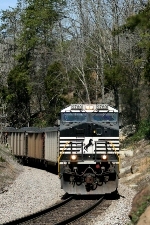 Description: NS 52V heads down the Winston Salem line near Starkey. Description: NS 78T is back on home rails as it slowly works up the grade between Frisco and Mt. Carmel. Description: NS 78T slides through the curve at Wininger after meeting the NS 719 at Kermit. 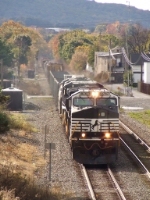 Both trains were using trackage rights on the CSX.